In the world of health care, from pathology labs to medical practitioners to pharmaceutical manufacturers, a mistake can mean much more than a regulatory fine or losing money – people’s lives and health are at stake. Hospitals, laboratories and other medical organizations have large numbers of people and need effective systems to make them work well together. I’ve been learning about how assessments are used in the health care sector. Here is the first of a series of blog articles in the theme of “learning from health care”. 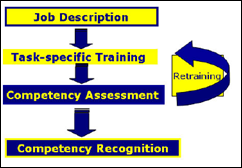 In this article, I’d like to share some of what I’ve learned about how pathology and other health care laboratories approach competency assessment. Laboratory personnel have to work tirelessly and in an error-free way to give good quality, reliable pathology results. And mistakes cost – as the US College of American Pathologists (CAP) state in their trademarked motto “Every number is a life”. I think there is a lot we can all learn from how they do competency testing. A good place to start is with the World Health Organization (WHO). Their training on personnel management reminds us that “personnel are the most important laboratory resource” and they promote competency assessment based on a job description and task-specific training as shown in the diagram on the right. If your organization relies on employees working accurately, I hope this provides value and interest to you. I will share more of what I’m learning in future articles.